Reverse Osmosis (RO) is one of the most convenient and economical methods of reducing unwanted contaminates in your drinking water. 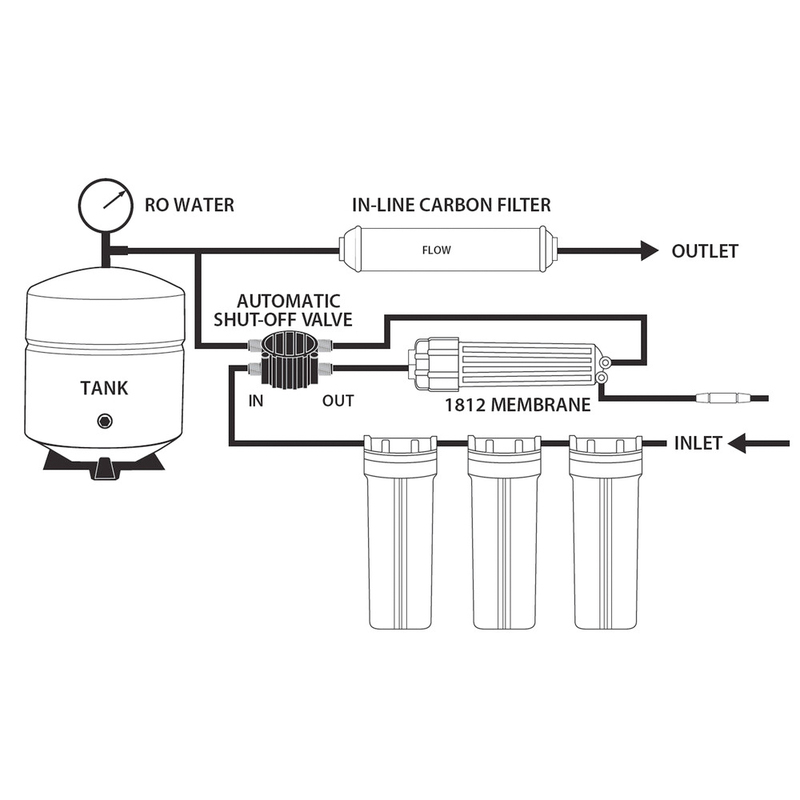 This system provides 50 gallons PER DAY (GPD) of clean, clear, refreshing drinking water and is an approved alternative to boiling water during boil water advisories. 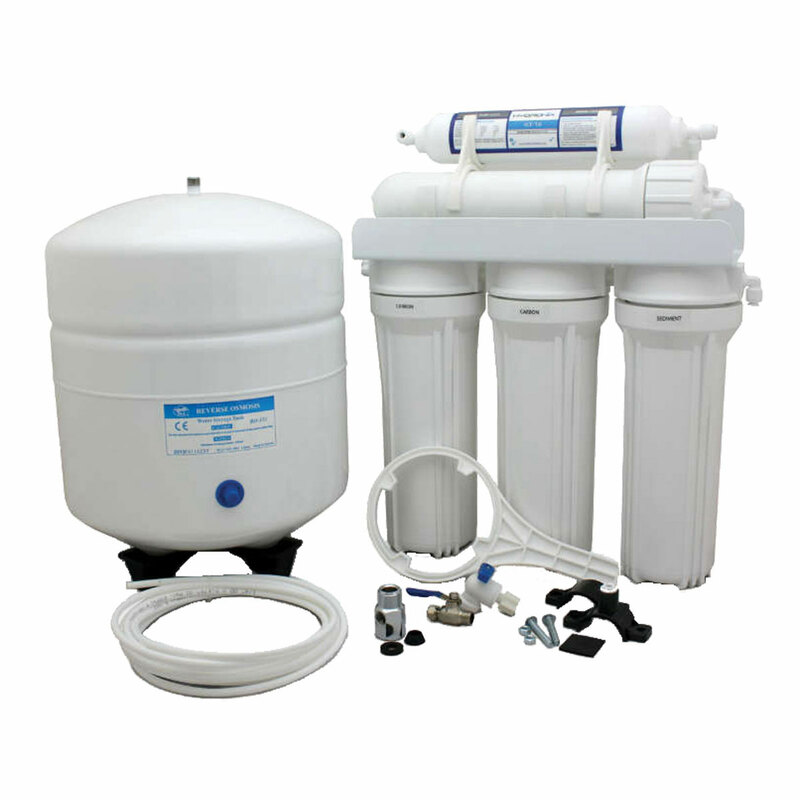 Reverse Osmosis is the process of filtering water molecules through a semipermeable membrane, causing most of the impurities and contaminant to be rinsed down the drain. The now treated water is routed to a special holding tank which can then be used for consumption. The Thin Film Composite (TFC) reverse osmosis membrane rejects a high percentage of impurities to bring you the most advanced RO technology at an affordable price. RO membrane: Change recommended based on periodic TDS rejection tests. Typical is every two years. STAGE 1 - (LIQ/510) 5 micron sediment pre-filtration for mechanical reduction of rust and particulate, and provides membrane protection. STAGE 2 & 3 - (LIQ/CB1010) activated carbon block for reduction of tastes, odors, chlorine, & organic impurities (2 Req.). STAGE 4 - (LIQ/M50) thin film composite Reverse Osmosis Membrane for reduction of dissolved solids, including the range of toxic heavy metals, plus Giardia & Cryptosporidium cysts. STAGE 5 - (LIQ/ICE) activated in line carbon post-filtration for final polishing of off-tastes & odors. Maintenance: Pre and post filters recommended change every six months for regular usage, or once a year in light usage. Not all products are currently in stock. Non-stocking items can be ordered, which may increase delivery times.